Hall of the Mountain King: Review: The Crown, "Crowned in Terror"
Review: The Crown, "Crowned in Terror"
Take the early sounds of Metallica, Megadeth and Slayer, throw them in a blender and turn it on the fastest speed. What comes out will probably sound a whole lot like The Crown. "Crowned in Terror" has gotten a very positive reception in the extreme metal community, and it's easy to see why. The band launches a full-out assault from the first cut, the title track. Guitarists Marko Tervonen and Marcus Sunesson alternate between edgy Slayer-like licks and chunky thrash riffs, while the vocals of former At the Gates screamer Tomas Lindberg shred the listener's eardrums. The strength of "Crowned in Terror," though, is the foundation the music is built on - the drumming of Janne Saarenpaa. Saarenpaa's skill and stamina is undeniable, and the listener can't help but be impressed when he cuts loose. But it's that same skill that causes a problem. There's a temptation to make the drums the featured instrument. On songs like "Speed of Darkness," there are spots where the drums take over and drown out everything else. That's a shame, because some of those songs have a lot going for them. But for every one of those, there's an "Under the Whip" or "Out for Blood," where Saarenpaa's furious double-bass attack lays the perfect foundation. Surprisingly, the band really shines when they throttle down, though. 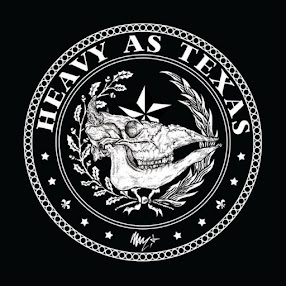 The slower riffs are crisp and impressive with a classic metal sound. One of the strongest songs on the album is also the slowest, "World Below." The tune chugs along at a pace that's practically lethargic by comparison, but displays some of the band's tightest musicianship. 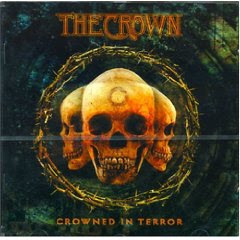 Overall, "Crowned in Terror" is a solid album, but it is admittedly an acquired taste. The Crown is certainly not for everyone. Review: Arch Enemy, "Wages of Sin"